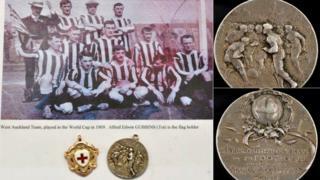 A winners medal from what has been dubbed football's "first World Cup" has gone under the hammer. Amateur side West Auckland FC won the Sir Thomas Lipton Trophy in Turin in 1909, after beating professional sides from across Europe. Alf "Tot" Gubbins was one of the County Durham coalminers on the team and who later emigrated to New Zealand. His grandson now put his medal up for auction and it sold at Anderson and Garland for £4,000. The auction house has revealed that the new owner is the great-nephew of Syd Douthwaite, a former secretary of the club. He has promised to return it to the village, and it will go on display in the Eden Arms pub.